The birth of Imam Ali bin Abi Taleb (as) took place under unique circumstances inside the Holy Kaaba at Makkah on the 13 th of Rajab (30th Amul Feel / Year of the Elephant) about 600 AD i.e. 23 years before Hijra of Holy Prophet Muhammad (saw). 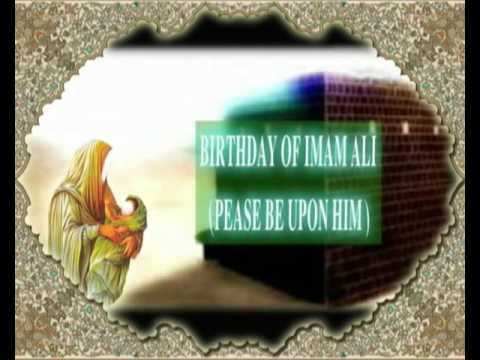 The age of Holy Prophet Muhammad (saw) at the birth of Imam Ali (as) was almost 30 years. It is considered unique because no prophet or saint has ever been born in a Holy sanctuary. Fatima bint Asad, the expectant mother of Imam Ali bin Abi Taleb (as) was praying outside the Holy Kaaba when she suddenly felt the labor pains and prayed to Allah (SWT) saying “O Allah! I believe in You and in the messengers and the scriptures You have sent. I believe in what has been said by my grandfather, Prophet Abraham (Ibrahim) who built the ancient house (Holy Kaaba). So, for the sake of the builder of this House, and for the sake of the child in my womb, I implore You to make my labor easy.” Just then the wall of the Holy sanctuary opened miraculously. As she stepped in, the wall closed behind her. Shortly after that she gave birth to her baby. The striking contrast behind Fatima bint Asad, the mother of Imam Ali bin Abi Taleb (as) and the period of pregnancy and delivery and that of Maryam bint Imran, the mother of Prophet Isa/Jesus (as) are indeed very interesting. Yes, this one example shows us the greatness of Fatima bint Asad, her child and their lofty rank in the sight of Allah (SWT)! The Noble Qur’an relates that when Maryam bint Imran was facing the pains of labour, she first decided to retreat to the house of worship. She was however ‘forced’ out of there and was told that the House of God is not a place to deliver a child! Therefore, she turned towards the east and secluded herself in the desert to give birth. However, when we research the Ahadith, we see that when Fatima bint Asad was about to deliver and had gone to the Holy Kaaba to perform the Tawaf (circumambulate) and complain to Allah (SWT) about her pains and make supplication for ease, the Holy Kaaba actually split open, welcoming her inside! For a period of three days, she remained in this holy sanctuary, only coming out after the birth of her son, Imam Ali bin Abi Taleb (as)! To understand the significance and importance of the place of birth of Imam Ali bin Abi Taleb (as), it is essential to know a little of the history of the Holy Kaaba. The first House of God was rebuilt and renovated at the command of Allah (SWT) by the Prophet Abraham (Ibrahim) assisted by his worthy successor, his son Ishmael (Ismail), under the supervision and guidance of the angel Gabriel (Jibril). These verses clearly depict the purpose of the Holy Kaaba, namely that it was to be a place of worship, that it was pure and sacred. And it was to this sacred place, the Holy Kaaba, that Providence led Fatima bint Asad, the mother of Imam Ali bin Abi Taleb (as). 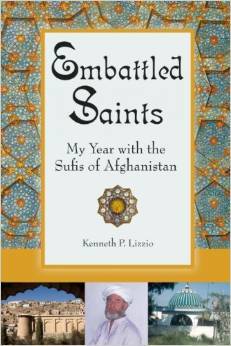 She felt weighed down by intense pain when Imam Ali was due to be born. She knelt to pray, and when she raised her head from her Prostration, the wall of the Holy Kaaba split as if by a miracle, to admit her within, and the portion of the wall returned to its normal position. The Holy Kaaba was sealed with Fatima bint Asad inside. Had it not been the Will of God, such a thing could never have happened. 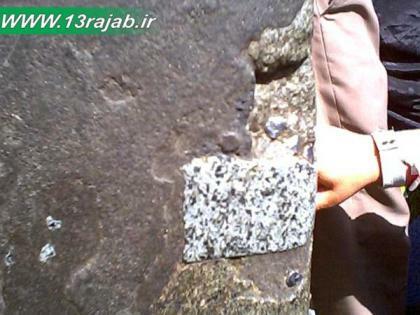 This crack is still there to this day on the wall of the Holy Kaaba. Some people, including Abbas ibn Abd al-Muttalib, Holy Prophet Muhammad’s (saw) uncle witnessed this miracle, who had been near the Holy Kaaba and started telling other people. The news spread like wildfire all over Makkah. The keys of the Holy Kaaba were brought to unlock the door, but all efforts ended in failure. On the fourth day of this happening, with awe, the wonderstruck crowds surrounding the Holy Kaaba witnessed the lock of the door falling of its own accord, and to their surprise, Fatima bint Asad emerged radiant from the sacred premises, cheerfully holding her newborn babe with his eyes close in her arms. “Assalamo alaika ya Rasoolallah” (Peace be upon thee O Prophet of Allah). 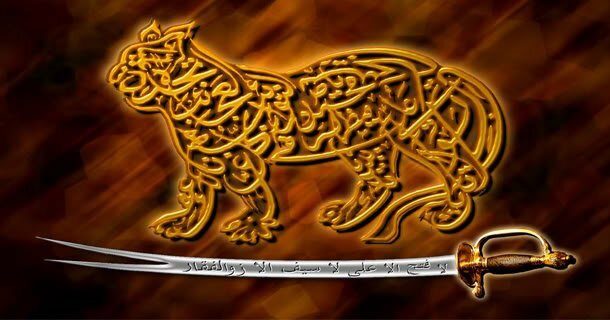 Thus it is an undisputed fact that Imam Ali bin Abi Taleb (as) was born a Muslim and his first words testified to the Prophethood of Muhammad (saw). Holy Prophet Muhammad (saw) lovingly took him into his arms. Imam Ali’s first bath after his birth was given by Holy Prophet Muhammad (saw), with a prediction that this child would give him his last bath. This prophecy was fulfilled on the death of Holy Prophet Muhammad (saw). Then Holy Prophet Muhammad (saw) recited the Adhan and Eqamah in the ears of the baby. Imam Ali bin Abi Taleb (as) accepted no other food than the moisture of Holy Prophet Muhammad’s (saw) tongue, which he sucked for several days after his birth. Holy Prophet Muhammad (saw) fondled him in his lap in his infancy, and chewed his food and fed Imam Ali bin Abi Taleb (as) on it. Holy Prophet Muhammad (saw) often made Imam Ali bin Abi Taleb (as) sleep by his side, and Imam Ali (as) enjoyed the warmth of Holy Prophet Muhammad’s (saw) body and inhaled the holy fragrance of his breath. Imam Ali bin Abi Taleb (as) has been described as having been found like a priceless pearl in the shell of the Holy Kaaba, or a sword in the sheath of Allah’s House, or as a lamp found in Allah’s Abode shedding Light all around. The felicitous Prophecy in Genesis 17:20 about the advent of a Prophet is said to point to the appearance of Holy Prophet Muhammad (saw) and to Imam Ali bin Abi Taleb (as) as the first of the twelve princes who are none other than the Twelve Imams. Imam Ali bin Abi Taleb’s (as) birth in the Holy Kaaba is unique, for this is the only known occasion on which a child was born within the precincts of the Holy place ever since its foundation thousands of years ago. When the lovers of Imam Ali bin Abi Taleb (as) go for Hajj, they always remember his birth in the Holy Kaaba and whilst making the Tawaf (the Ritual Circling of the Holy Kaaba), they feel proud and happy that Imam Ali bin Abi Taleb’s (as) name is linked with the House of God, and at every circuit they look towards the wall which had split in two to allow Imam Ali bin Abi Taleb’s (as) mother to enter the Sacred Premises. This particular place is known as ‘MUSTAJAR’, and here a special ritual is highly recommended. 11.Hazrat Hakeem bin Hizaam رضی اللّٰــه تعالیٰ عنــــــــہ se Muta’lliq kaafi riwaten milti hain k ap ki paidaish khana e Kaabah me hui.